HOUSTON - After cheering each other on as their names were called in Houston in August 2018 as the first NASA astronauts to launch from the U.S. in eight years on an American-built spacecraft, News 6 had the privilege to meet all nine of NASA's commercial crew astronauts. NASA Administrator Jim Bridestine, along with SpaceX and Boeing management, announced at Johnson Space Center in which spacecraft the nine astronauts would launch from Cape Canaveral: Boeing's Starliner CST-100, or the SpaceX Crew Dragon. Of the nine astronauts who will start a new chapter of American space history, three have never been to space before. Those three -- Victor Glover, Nicole Mann and Josh Cassada -- are also from the first class of NASA astronauts comprised of equal parts women and men. It was a first in NASA history in 2013 and has been the standard since. 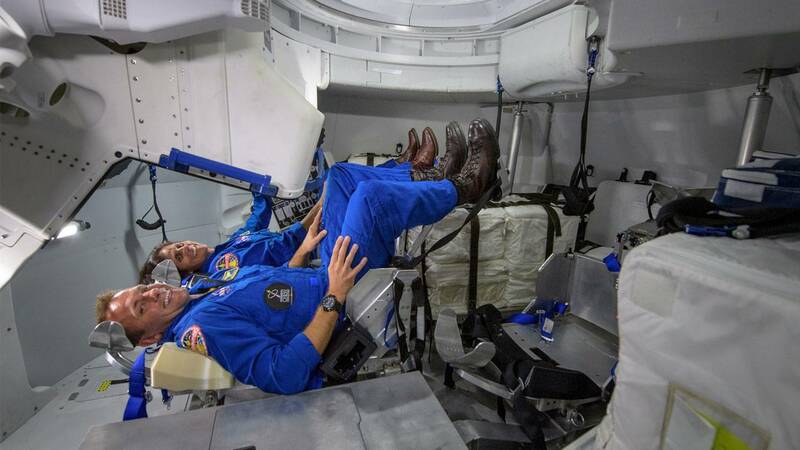 The other six astronauts selected by NASA to launch on the Starliner CST-100 and Crew Dragon have logged hundreds of hours in space and were some of the last to step foot off the last Space Shuttle missions. Chris Ferguson, Suni Williams, Mike Fincke, Bob Behnken, Doug Hurley and Michael Hopkins were there for the end of one legacy and will be part of a new era returning crewed launches to American soil on American rockets. Here's what we learned from this group of well-qualified space explorers. Williams is a veteran astronaut with two trips to the International Space Station totaling 322 days flying on both the Space Shuttle and Russian Soyuz spacecraft. With more than 3,000 flight hours in over 30 different aircraft, Williams served in the U.S. Navy flying helicopters on relief and combat missions. Later, she became a test pilot and instructor. Williams was deployed when she was selected to be a NASA astronaut in 1998. Her love for the space program is infectious. Wearing Converse Chuck Taylors printed with stars and galaxy swirls, Williams talked about how she can't wait to share the Starliner with NASA's international partners. "I know our cosmonaut friends can't wait to fly on our spacecraft, and we'll always fly on their spacecraft, and I think that shows the trust that we have in each other and in each other's space programs," Williams said. "I think that will complete the, you know, the whole pie there when we get them on board with us going up to the space station." Those unsure of NASA's embrace of the word crewed, and not manned, should get used to it. Williams said it really shouldn't matter anyway. 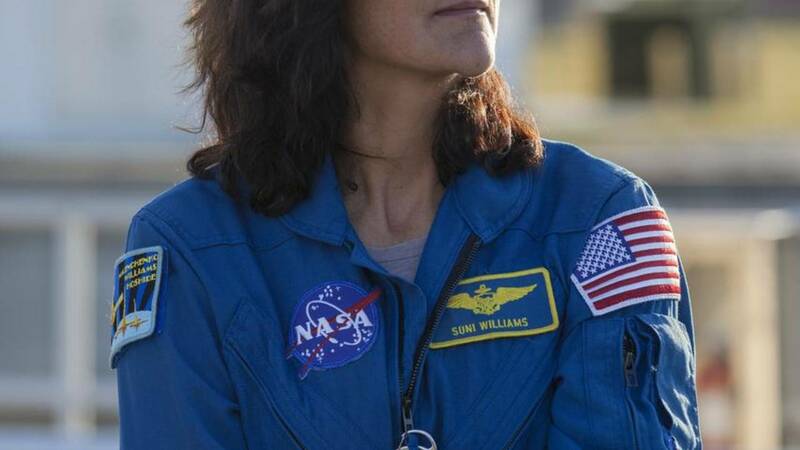 "When I was a helicopter pilot, when I did my first spacewalk, when I was living on the space station ... the helicopter doesn't know if I'm a girl or a boy," Williams said of being one of two female astronauts in the first round of commercial launches. "The space station doesn't know, the spacesuit doesn't know. So why should it really matter, right?" With Williams on the Starliner's first mission to the Space Station will be Josh Cassada, a "rookie" astronaut who will be making his first spaceflight. Williams is most looking forward to seeing the all the space enthusiasts who come out to Kennedy Space Center to see the launch. When she launched with the Russian space program, only about 15 friends and family were able to make the trip to the Baikonur Cosmodrome in Kazakhstan. "With the shuttle, there were tons of people, friends and family, people with their campers driving to Florida to watch a rocket launch that's going to be huge, and then getting the added benefit of flying with a rookie for the first time is going great," Williams said. "So it brings it all back." Cassada, a Minnesota native and Navy test pilot, has a doctorate in physics with a specialty in high-energy particle physics. In his "previous life" Cassada worked on high-energy particle physics at Fermilab, which is dedicated to understanding matter, energy, space and time. "We got to do some really exciting stuff and very similar in that it was an international collaboration," Cassada said, comparing his time at Femilab to the international partnerships on the ISS. "We had over 40 universities, I think, made up of 13 different countries represented. So same idea, different backgrounds, different nations trying to solve the same problem, and it was amazing." As a Navy pilot Cassada was deployed to the Western Pacific, Mediterranean Sea and Central America, and served in operations including Iraqi Freedom, Enduring Freedom and tsunami relief. He was selected in the NASA astronauts class of 2013. Cassada will fly on Boeing's Starliner during the spacecraft's first mission to the ISS. It will also be his first trip to space and he's only ever seen one launch in person. During the announcement in Houston, there were dozens of children in the audience who have never seen a U.S. launch. 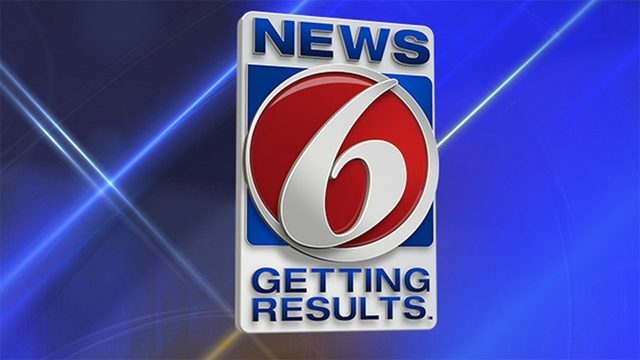 "I'm excited for them because hopefully, we can be in a position to to give them the tools they need to those kids that were in the audience to do some amazing things that hopefully we can read about when they're out doing it," Cassada said. Cassada and his crewmate Suni Williams have already spent a good amount of time together, along with the other NASA astronauts. Williams said she got to know Cassada and his 2013 astronaut class pretty well as a member of the astronaut selection board. The crewmates said with a laugh that it won't be a problem that Cassada is left-handed and Williams is right-handed. "If we're inverted, it's the same side," Cassada said. 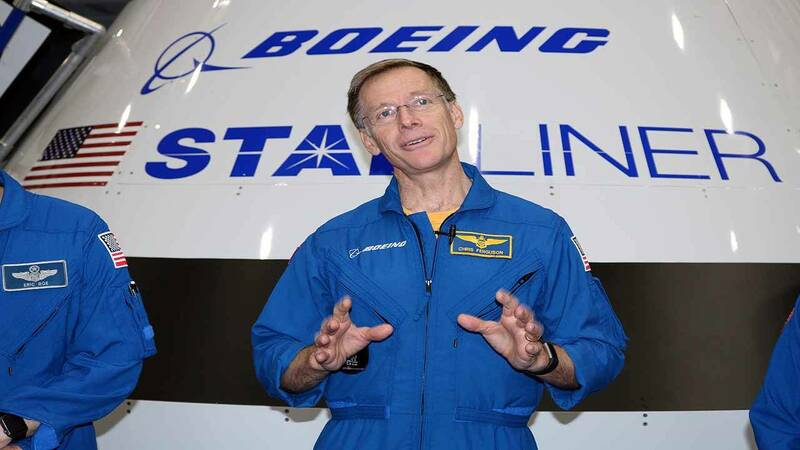 UPDATE: NASA Astronaut Boe was removed from the first flight of Boeing's Starliner for medical reasons, according to NASA. Boe is an amazing pilot and human which is why News 6 is keeping him on this list to allow people to learn more about him. Eric Boe, a Florida native and U.S. Air Force pilot, was selected for the astronaut program in 2000. He piloted both Endeavour and the final mission with Discovery in 2011. Boe, talks about the Discovery as if she is an old friend. He was on the crew of its last mission to the ISS. Between all of its missions, Discovery had totaled about a year in space by the time NASA retired the space shuttle. Boe told News 6 he recently saw Discovery at the Smithsonian Air and Space Museum for the first time. “It's just interesting to think about the ship transitioning from something that you trained on for years and years and years, we did thousands of hours of training, and to see it in the museum and, you know, celebrated, as she should be," Boe said of that visit. On the other hand, Boe is excited to be working with a new spaceship at the beginning of its journey. With more than 6,000 hours piloting more than 50 aircraft, Boe said he hopes to see spaceflight as common as a trip to the airport one day. "Hopefully one day, everyone will be an astronaut, get the opportunity to go to space and we'll be sitting on the moon going, 'Why is my moon ship late?' and not really thinking about the technology," Boe said. NASA astronaut E. Michael “Mike” Fincke replaced Eric Boe on the Boeing CST-100 Starliner’s first flight test with crew scheduled to launch no earlier than August. Fincke became an astronaut in 1996 and has logged more than 382 days in space, which includes nine spacewalks, according to NASA. He served as mission specialist on space shuttle Endeavour’s final mission. "We welcome NASA astronaut Mike Fincke, who brings nearly two-and-a-half decades of spaceflight experience, to the Boeing Starliner team," a Boeing spokesperson said after the crew change was announced. Chris Ferguson is a former NASA astronaut and retired U.S. Navy captain who now works for the Boeing Starliner program. He was the last crew member to step off Atlantis after the final space shuttle mission in 2011. Since then, no man or woman has launched on U.S. spaceship from Cape Canaveral. "I wanted to be the last one off. I wanted to, sort of, be alone with my thoughts as the last guy to walk off the space shuttle," Ferguson said of taking his time walking off Atlantis as the last shuttle astronaut, adding at the time, he had no idea that seven years later he would be among the first humans to launch from Cape Canaveral again. An estimated 1 million people came out to Florida's Space Coast to see the final shuttle launch. For Ferguson, when he launches as the commander on Boeing's Starliner with NASA astronauts Boe and Mann, he hopes just as many people come out to see them blast off. "I think America needs this, they really do it," Ferguson said. "That's not to say we've not been busy in space. Sure, we've been counting on the Russians to get us back and forth. I think it's time to take that back." Mann's friends and fellow crew call her "Duke." She told News 6 the nickname was actually her call sign in the Marines, because of her walk, and she learned to embraced it. "Apparently, I walk kind of a little funny, kind of like John Wayne, you know. And so of course, people make fun of me and John Wayne was known as 'the duke,'" Mann said. "So that's where Duke comes from." The California native served as a lieutenant colonel in the Marine Corps and a test pilot for the F/A-18 Hornet and Super Hornet. 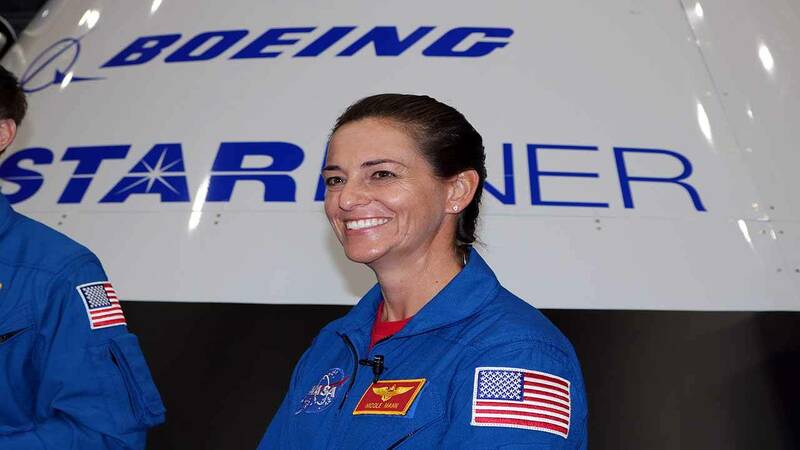 She served on combat operations in Iraq and Afghanistan and she was selected in 2013 for the NASA astronaut program. The first crewed test flight of Boeing's Starliner will be Mann's first trip to space. Mann said she never had the opportunity to see a shuttle launch in person growing up, but she hopes the return to human spaceflight in the U.S. empowers the next generation of astronauts. "Hopefully, it motivates them to study hard in school and think about what they want to do and think about how they want to contribute to this mission to exploring space," Mann said. As for if Mann had a preference about wearing a Boeing or SpaceX spacesuit Mann said, "I'm just happy to be wearing a spacesuit." 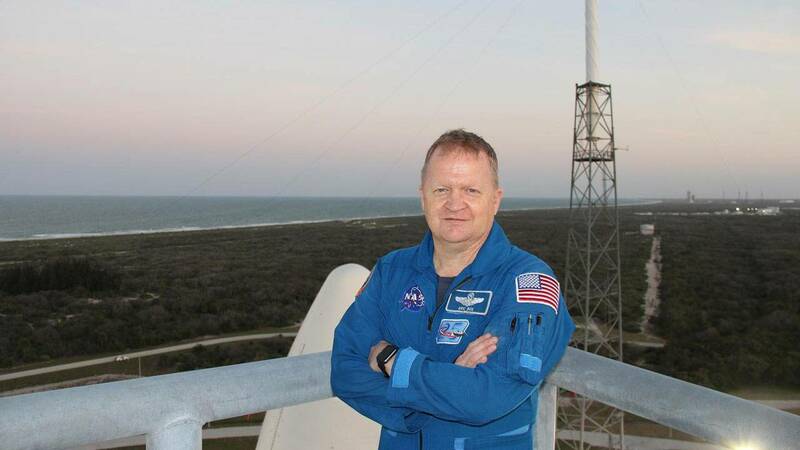 Col. Bob Behnken is a native of the Show Me State and wears it as a badge of honor a colonel in the U.S. Air Force and one of the first to fly on SpaceX's Crew Dragon. 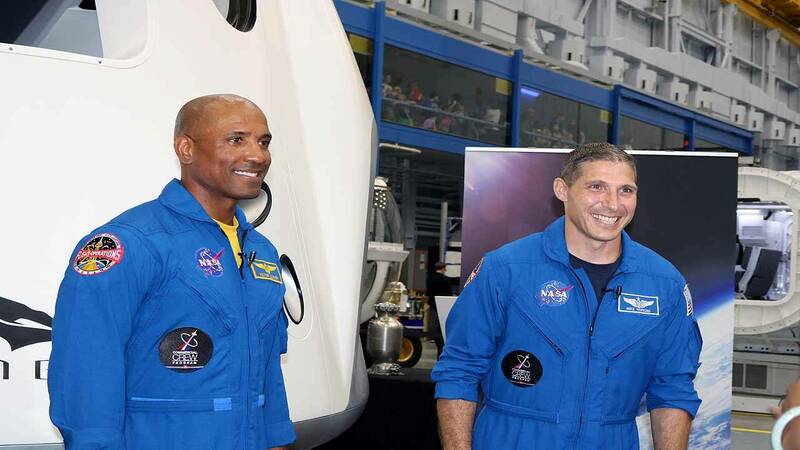 The veteran astronaut even challenged NASA's new administrator to a simulated test flight showdown of the Crew Dragon at SpaceX's headquarters in Hawthorne. "(Bridenstine) said he already had and I told him that I had done it better," Behnken said with a grin. "We'll see if he turns up for the challenge and we fly side by side." Behnken logged more than 708 hours in space and six spacewalks during his two missions on Endeavor. Some of his 37 hours spacewalking were spent assembling the ISS. The automation on Crew Dragon will be a change for Behnken and his fellow crewmate, NASA astronaut Doug Hurley. "The workload is very much reduced (on Dragon), the shuttle took a lot of people to operate both in space and on the ground," Behnken said. "That vehicle just didn't have, you know, the computing power to be able to do the level of automation that we can do now." He was excited to finally know which spacecraft he would get to launch in, saying that it's nice to match a face with the spacesuit. "When you shake the hand of the guy who did the actual installation of some hardware or the woman who did the engineering behind it, it makes a big difference to be able to put your face to them because you're basically putting your lives in their hands, and it makes a big difference, of course, if they know who you are," Behnken said. The only downside of flying with SpaceX in the company's custom sleek white spacesuits? Behnken said his son's favorite color is blue. "I've got to go home and break his heart that I won't have a blue space suit to fly in on the Dragon. Maybe we can talk to SpaceX and we can Photoshop it a little bit just for him," Behnken said. But the color doesn't matter, as long as it gets them "safely to orbit and safely back home," he said. 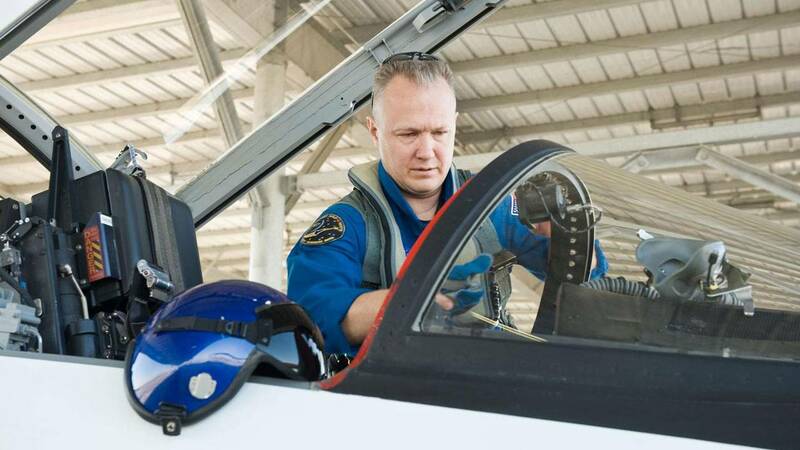 NASA astronaut Doug Hurley prepares for a flight in a NASA T-38 trainer jet at Ellington Field near NASA's Johnson Space Center in March 2011. Doug Hurley, a former fighter pilot in the U.S. Marine Corps, is a man of few words, or maybe it was just the fact that it was still sinking in. 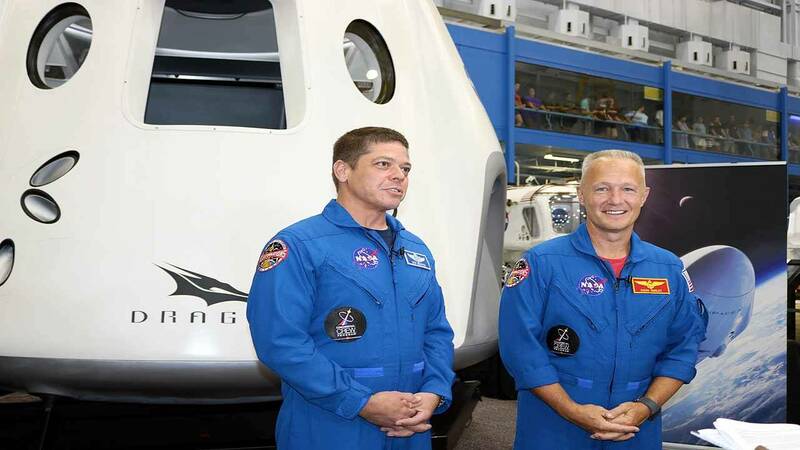 Hurley and his fellow astronaut Bob Behnken had just been selected to be the first to take SpaceX Crew Dragon through its paces and launch into space next year. They had been working toward this moment for three years. "Honestly, it's probably too early for me for me to talk about it and think about it," Hurley said after the commercial crew announcement. "We've got to be focused on completing this test flight and turning Dragon into an operational vehicle that we can get people to, from the space station. I think maybe after that work is done, we can we can sit down and reflect on that day." Both Hurley and Behnken were selected as part of the NASA astronaut class of 2000. Hurley flew on Endeavor and on the final Space Shuttle mission in 2011 with Atlantis. It will only be the two astronauts launching from Kennedy Space Center 39A no earlier than next year, which is a little different than during the shuttle program. "It took a couple people and sometimes maybe three or four people to actually do the actual flying of the (shuttle) thoroughly. Whereas these vehicles have a lot more automation, and in a lot of phases of flight, we won't be flying the vehicle at all," said Hurley, adding that he and his co-pilot will be testing manual flying capabilities on Crew Dragon during the test flight. Hurley's wife, Karen Nyberg, is also a NASA astronaut. Talk about a power couple. 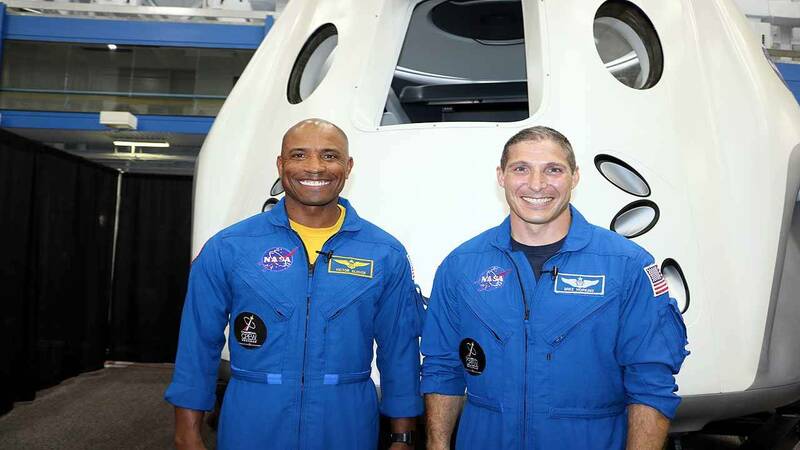 When Victor Glover heard his name called as one of two astronauts who will fly on Crew Dragon's first mission to the space station, he wasn't thinking about himself. "I was just I was thinking about my classmates I trained to be an astronaut with, all my buddies that are test pilots," Glover said. "This is like for all of us. This is a dream for any test pilot, and so for all of my friends in the astronaut office, it just felt good to be up there representing all of us." A U.S. Navy commander and graduate of the U.S. Air Force Test Pilot School, Glover was selected in 2013 for the NASA astronaut program. This will be Glover's first journey into space. He's looking forward to all the firsts that come with it. "Every moment will be the first time I've done that. The first week will be my first first week, the first month will be my first month," Glover said of going to the space station. "I am looking forward to that first moment when there's a break in the action and there's a window near me and I can look back and see the Earth, you know, spaceship Earth." Glover said he felt he and his fellow astronauts were walking in the footsteps of the first Mercury 7 crews during the announcement, but this time, the faces of the crew represent a diverse America. "To look at the crowd, the faces of the folks up there, and to see my crew mate Nicole (Mann) and to see Sunni (Williams) and to see women up there, you know, and to see just the representation of this country in general," Glover said. "It's a great time to be here." Glover hopes to learn from his experienced crewmate, NASA astronaut Mike Hopkins, as much as he can stand to share. Hopkins served in the U.S. Air Force as a test pilot and engineer. 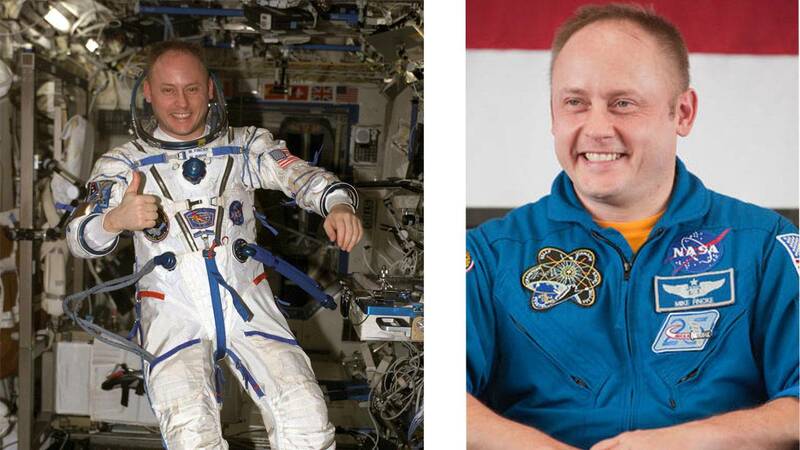 He was selected in 2009 to be a NASA astronaut, just before the end of the shuttle program. He launched with NASA's Russian partners in Kazakhstan, spending 166 days on the space station. A Missouri native, Hopkins, who grew up on a farm outside Richland, said he wouldn't be able to do any of this without his family support system. "She is the rock that keeps our family going, and it's so extremely important," Hopkins said of his wife, Julie. For Hopkins, bringing launches with astronauts back to the U.S. is essential. "I think you if you want to be a leader in space, we need to be able to launch our own astronauts into space," Hopkins said. Hopkins can't wait to see his crewmate experience the weightlessness of space for the first time. "The great thing for me is, of course, I've had opportunity to do all those firsts," he said of Glover. "But now, I get to watch him go through all of those firsts, and that's going to be fantastic." Both men were grinning ear-to-ear all day after the the announcement at Johnson Space Center. Hopkins said the infectious energy in the JSC auditorium is coming with him and Glover as they begin this journey. "One of the reasons I'm very excited about flying with this guy, because if you haven't noticed, that smile, with that smile comes a lot of energy a lot of excitement," Hopkins said.